This data set provides four land cover and ecosystem classification maps for northern Alaska. The maps were produced for several projects and from different data sources including Landsat imagery and existing maps and models, and cover a range of ecosystem and vegetation classes. The data used to derive the maps covered the period 1976-08-04 to 2014-09-01. There are six data files included with this data set: three maps in GeoTIFF (.tif) format, two layer files corresponding to two of the tiffs (.lyr), and one compressed shapefile (.zip). The shapefile is also provided in .kmz format for viewing in GoogleEarth, along with two map source reports, as companion files. Figure 1. Ecological landscape sections from Landscape Level Ecological Mapping of Northern Alaska (2014 Update). From Jorgenson and Grunblatt, 2013. This data set provides four land cover and landscape-level ecological maps for northern Alaska. The maps were produced from several data sources including Landsat data and existing maps and models, and cover a range of ecosystem and vegetation classes. The data used to derive the maps cover the period 1976-08-04 to 2014-09-01. Landsat MSS Land Cover Map of Northern Alaska: A landcover map in GeoTIFF (.tif) format. The map covers all of northern Alaska, from the Brooks Range divide to the coast. It is in 50-m pixels resolution, and has nine land cover categories based on an unsupervised classification of a Landsat Multispectral Scanner (MSS) composite. A layer file (.lyr) with symbology is also included which corresponds to this tiff file. The Landsat data used to derive the map cover the period 1976-08-04 to 1986-09-13. Ecosystems of Northern Alaska: A landcover map in GeoTIFF (.tif) format. This map is in 30-m pixel resolution. The legend has 36 terrestrial ecosystem classes and 4 non-vegetated classes, nested within five landscape types: coastal, riverine, lowland, upland, and alpine. It covers all of Alaska north of the latitudinal treeline on the southern side of the Brooks Range. A layer file (.lyr) with symbology is also included which corresponds to this tiff file. The data used to make the map cover the period 1986-1999. 2013 NSSI Landcover for North Slope of Alaska: A landcover map in GeoTIFF (.tif) format. This map has 24 classes and is a mosaic of different map sources. The area covers the far western Arctic, and for the area between the National Petroleum Reserve - Alaska (NPRA) and Arctic National Wildlife Refuge. Landscape Level Ecological Mapping of Northern Alaska (2014 Update): When unzipped, this file provides a shapefile (.shp). This is the 2014 update to the 2006 base (and 2012 update) ecological landscape map for northern Alaska. 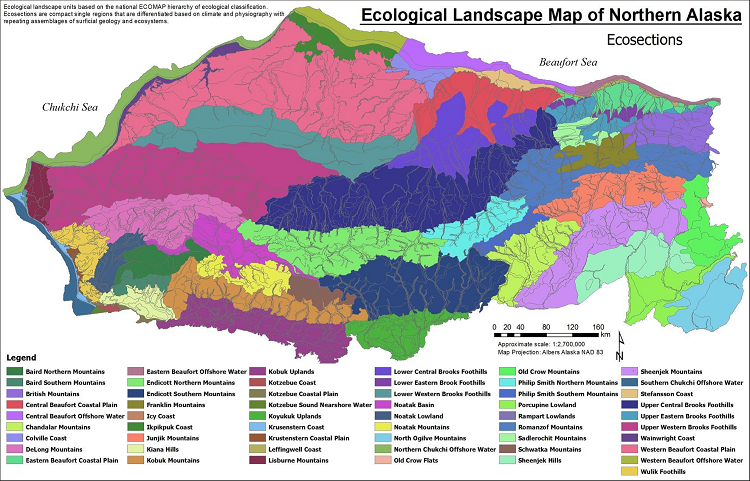 It includes 533 ecological subsections, nested within 55 eco-sections and 14 ecoregions. The entire map covers 413,089 km2, of which 391,951 km2 covers the land portion, excluding the Beaufort and Chukchi seas. There are six data files included with this data set: three maps in GeoTIFF (.tif) format, two layer files corresponding to the tiffs (.lyr), and one shapefile (.shp). The shapefile is also provided in .kmz format as a companion file. Two map source reports are also included as companion files. Landcover data (map) in GeoTIFF (.tif) format. The map covers all of northern Alaska, from the Brooks Range divide to the coast. It is in 50-m pixels resolution, and has nine land cover categories. This is the map named Landsat MSS Land Cover Map of Northern Alaska. NoAk_Landscapes_2014.zip A compressed shapefile (.shp). It provides the 2014 update to the 2006 ecological landscape map for northern Alaska (updated in 2012) and includes 533 ecological subsections, nested within 55 eco-sections and 14 ecoregions. The entire map covers 413,089 km2, of which 391,951 km2 covers the land portion, excluding the Beaufort and Chukchi seas. This is the map named Landscape Level Ecological Mapping of Northern Alaska (2014 Update). File name: NoAk_Landscapes_2014.zip: When unzipped provides NoAk_Landscapes_2014.shp. These data are also provided as a companion file in .kmz format for viewing in GoogleEarth. Table 4. Attributes of the shapefile. SUBSECTION Subsection name. Subsections are areas within Sections with similar surficial geology, lithology, geomorphic process,soil groups, subregional climate, and potential natural communities. Subsection boundaries usually correspond with discrete changes in geomorphology. Names of Subsections are usually derived from geologic features. SECTION_ Section name. Sections are areas of similar sub-regional climate, geomorphic process, stratigraphy, geologic origin,topography, and drainage networks. Such areas are often inferred by relating geologic maps to potential natural vegetation "series" groupings such as those mapped by Kuchler (1964). In recent years, numerical analyses of weather station and remotely sensed climatic information have assisted in determining Section boundaries. Boundaries of some sections approximate geormorphic provinces (for example, Blue Ridge) as recognized by geologists. Section names generally describe the predominant geomorphic type or feature upon which the ecological unit delineation is based, such as Flint Hills, Great Lakes Morainal,Bluegrass Hills, Appalachian Piedmont. Table 5. Geographic extent of the shapefile. There are four companion files provided with this data set described below. An ecological land classification is essential to evaluating land resources and refining management strategies for various areas. More specifically, a landscape-level stratification can be used to more efficiently allocate inventory and monitoring efforts, to improve land cover classifications developed from remote sensing, to partition ecological information for analysis of ecological relationships and develop of predictive models, and to improve recommendations for ecological restoration. The maps were produced from several sources. Refer to the related publications for additional details regarding the individual maps. These data were obtained from the Alaska Arctic Geoecological Atlas (http://agc.portal.gina.alaska.edu), which provides access to existing Arctic vegetation plot and map data in support of the ABoVE campaign. The maps were produced from several data sources including Landsat data and existing maps and models, and cover a range of ecosystem and vegetation classes. The data used to derive the maps cover the period 1976-08-04 to 2014-09-01. This map includes nine land cover categories. It covers all of northern Alaska, from the Brooks Range divide to the coast. It is based on an unsupervised classification of a Landsat Multispectral Scanner (MSS) composite created by the National Mapping Division, U.S. Geological Survey EROS data center, Anchorage, Alaska. Landsat scenes used covered the period 1976-08-04 to 1986-09-13. Geobotanical maps and earlier Landsat-derived maps of the region were used to interpret the spectral classes. A preliminary land-cover map of northern Alaska was made by extrapolating a Landsat Multi-Spectral Scanner (MSS)-derived classification of the Kuparuk River Region (KRR) to all of northern Alaska. A 26-scene mosaic was used that was previously made by the EROS Data Center, and a K-means unsupervised classification algorithm to produce eight broad land-cover categories. Ancillary data were used to improve the classification for a region of sandy tundra not encountered in the KRR and to separate shadows in the mountains from water and wetlands elsewhere. For additional details, refer to Muller et al. (1999). This landcover map includes 36 terrestrial ecosystem classes and 4 non-vegetated classes, nested within five landscape types: coastal, riverine, lowland, upland, and alpine. The map was funded by The Nature Conservancy to provide a seamless ecological context for analysis of the distribution of biodiversity in the Northern Alaska ecoregion. It covers all of Alaska north of the latitudinal treeline on the southern side of the Brooks Range. Map classes were modeled using existing land cover maps covering portions of the project area, integrated and reclassified using ancillary information to partition ecological characteristics. Physical, biological and geographical information were incorporated to produce the ecosystem classification. The data used to make the maps cover the period 1986-1999. The data were re-interpreted and combined into a map of consistent thematic classification and spatial resolution to generate a seamless, unified map of terrestrial ecosystems for the project area. For additional details, refer to Jorgenson and Heiner (2003). Table 8. 36 ecosystem classes nested within five landscape types: coastal, riverine, lowland, upland, and alpine (Nowacki et al. 2001). This map includes 24 landcover classes. The map area was delineated using the North Slope Borough boundary. The map includes an approximately 60 million acre area stretching from the border of Canada to Pt. Hope in the western arctic and from the Arctic Ocean south to the Brooks Range. Areas to the west of the NPR-A (west arctic area) and also areas between the NPR-A and Arctic NWR (Prudhoe/Toolik area) had previously not been mapped using Landsat 30 meter resolution data. New landcover maps were created for the west arctic and Prudhoe/Toolik areas. Field data were collected during 2008 (west arctic -Wainwright), 2010 (Prudhoe/Toolik), and 2011 (west arctic - Pt. Hope) to be used as reference data for image classifications. The western arctic area was classified using an iterative, combined supervised/unsupervised image processing technique that has previously been used to map land cover for more than 100 million acres throughout other portions of arctic and boreal Alaska (Ducks Unlimited, Inc., 2013). The Prudhoe/Toolik area was mapped using a combination of a random forest classifier supplemented with iterative, combined supervised/unsupervised classifications. The map was part of the North Slope Science Initiative (NSSI), a multi-year project to produce a moderate resolution landcover base map for the North Slope of Alaska to serve as a primary base layer for long-term science and planning activities on the North Slope. (1) For the NPR-A area, existing landcover maps produced by the Bureau of Land Management (BLM) and Ducks Unlimited, Inc. in mid-1990's were crosswalked to the NSSI land cover map classification scheme. Reviews of the 1990's NPR-A maps by many ecologists and biologists familiar with the area indicated that the Dwarf Shrub and Tussock Tundra classes were mapped incorrectly in the areas south of the arctic coastal plain and into the Brooks range. For this reason, these two classes were masked out. (2) New Landsat TM5 images acquired between 2005 and 2010 were downloaded, and those masked areas were reclassified using these recent Landsat images. (3) The updated classification for these areas were then overlayed onto the crosswalked NPR-A map to replace the incorrectly mapped Dwarf Shrub and Tussock Tundra pixels. (4) The corrected NPR-A map was then mosaiced with the new NSSI maps from the west arctic and Prudhoe/Toolik areas. In areas where the Landsat TM images used in the west arctic and Prudhoe/Toolik maps overlapped the NPR-A, the west arctic and Prudhoe/Toolik maps were required to eliminate clouds from this area. For additional details refer to the companion file NSSI_Land_Cover_Map_Final_Summary_Report.pdf. Table 9. Area and percentage of area mapped by land cover class. This is the 2014 update to the 2006 ecological landscape map for northern Alaska (previously updated in 2012). This product provides landscape level ecological mapping of northern Alaska. It includes 533 ecological subsections, nested within 55 eco-sections (see Fig.1) and 14 ecoregions covering 413,089 km2 (Jorgenson and Grunblatt, 2013). provides results in format appropriate for regional GIS analysis at an approximate scale of 1:300,000 (±150m). For additional details refer to the companion file NorthernAK_Landscape_Mappping_Field_Photos_Final_Report.pdf. Ducks Unlimited, Inc. North Slope Science Initiative Landcover Mapping Summary Report, Editors: Keith Boggs, Tina Boucher, Jeff Campbell, Dan Fehringer, Scott Guyer, Liza Jenkins, John Payne. October 2013. Jorgenson, T.M., and Grunblatt, J. 2013. Landscape-Level Ecological Mapping of Northern Alaska and Field Site Photography. Final report. Jorgenson, M. T. and M. Heiner. 2004. Ecosystems of northern Alaska. ABR, Inc. and The Nature Conservancy, Anchorage, AK. Jorgenson, M.T. and M. Heiner. 2003. Ecosystems of northern Alaska. 1:2.5 million-scale map produced by ABR, Inc., Fairbanks, AK and The Nature Conservancy, Anchorage, AK. Muller, S. V., A. E. Racoviteanu, and D. A. Walker. 1999. Landsat MSS-derived land-cover map of northern Alaska: Extrapolation methods and a comparison with photo-interpreted and AVHRR-derived maps. International Journal of Remote Sensing 20:2921-2946. Nowacki, G., P. Spencer, T. Brock, M. Fleming, and T. Jorgenson. 2001. Ecoregions of Alaska and neighboring territory (map). U.S. Geological Survey, Reston, VA. The Nature Conservancy. 2003. Alaska - Yukon Arctic Ecoregional Assessment Update #2: Predictive Terrestrial Ecosystem Model. Anchorage, AK.